Say Hello to Julie Pogue! As the season of Derby begins in Kentucky, so begins the season of searching for the perfect home. 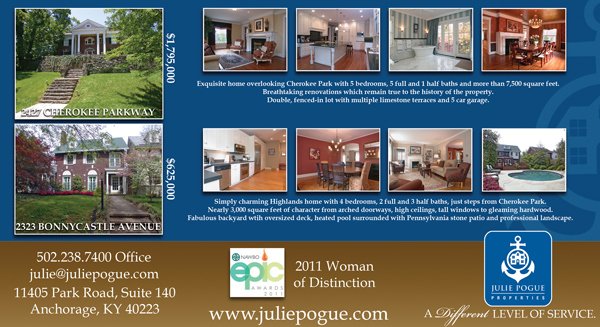 Julie Pogue was recently featured in Achorage Living, the local Anchorage community magazine. Woman to Woman: Say Hello to Julie Pogue! “I am a lucky gal with a husband of almost 30 years and two amazing kids who make life a lot of fun,” says Julie Pogue. What more could a woman ask for? Maybe a thriving career – and Julie has that too. Julie is the managing broker and owner of Julie Pogue Properties, which makes her unique. She is one of only a handful of women in Kentucky who own their own real estate company and choose to sell and manage an office by themselves. She earned her Bachelor and Master’s Degree in Education at the University of Texas before landing the job that she loves. Julie has now been in the real estate business in Louisville for more than 20 years. 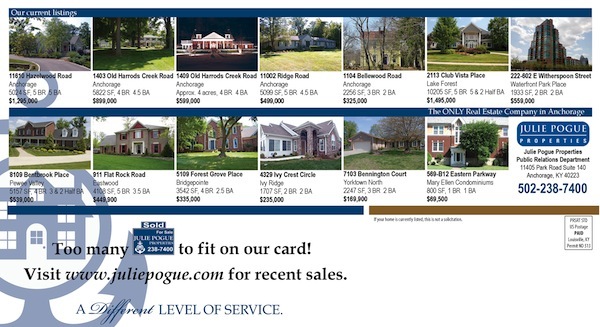 She sells houses of all shapes and sizes throughout the greater Louisville metropolitan area. 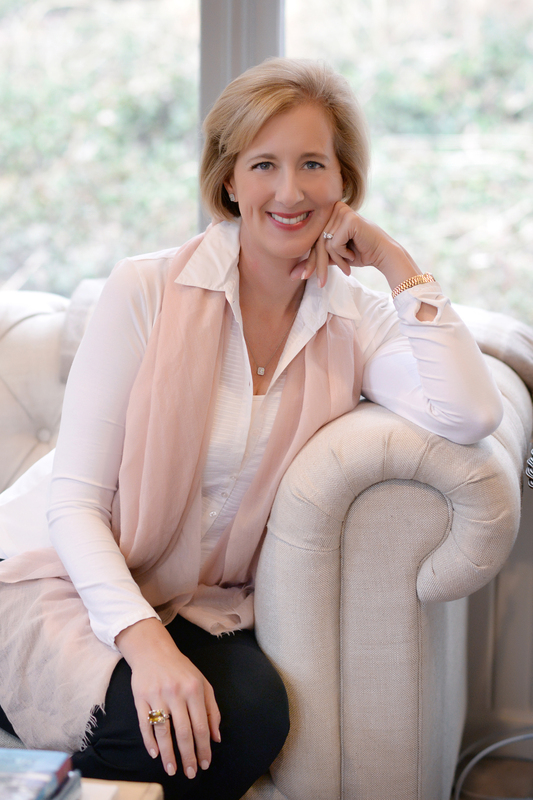 She has grown her business to one of Louisville’s premier real estate agencies – and one of the most successful residential real estate companies in the region. She has done so because she is passionate about her profession. As to whom she admires, that would have to be her mother. “She’s incredibly kind, hard-working, and loving. Definitely my best friend next to my husband,” says Julie. Julie does, however, have one pet peeve – waiting on hold with a call center and having to push buttons to reach a live person. Can you blame her? We are honored to feature Julie Pogue in our Woman to Woman feature this month. What an extraordinary person! A couple of weeks ago I wrote about the book titled, Who's Got Your Back. Well, I want you to know that I have the best office family anyone could ask for and I appreciate each and every one of them! I am a very blessed girl to have them all. I had the occasion to travel in Europe and was not as accessible as I normally would have been. Everything was taken care of and handled at the office with grace and professionalism. I love that we all have each other's backs and work together as a true A Team should. Each and every one is honest, kind and hard-working and most of all, they care very much for one another. Life is short--so many people hate their jobs and those they work beside--I am so glad that is not us! This a very tough, competitive, exhausting, not to mention, sometimes heart breaking profession; but it is also very rewarding and their is no other job I would rather do. I would like to thank my office family for being an integral part of my team! Here is wishing much success, happiness and love to you all. Please take a moment to meet my team by going to my home web page and click on the third tab from the right at the top marked 'Meet.' Then select 'Meet Our Team' in the drop down box. These are the folks who assist me in being sure we always provide our valued clients with the BEST service possible!